San Francisco, San Antonio, Austin, Boston, New York, Chicago, Calgary, Edmonton, Ottawa, Washington D.C., Toronto, Pacific Grove, Long Beach, and Palm Springs. These are the cities I have traveled to over the last few years in my role as a Mathematics Learning Specialist for Buzzmath. Traveling and meeting people is why our team loves the road so much. Some of our best reflections and thoughts come from moving through our destination points, each one providing interactions and memories that get banked. The band The Black Crowes wrote a song called “Wiser Time”, which richly embodied the potential of traveling, and the reservoir of creativity and connection that it taps into. Being a company that provides a digital math platform, the experiences and wealth of knowledge that is accumulated at these math conferences cannot be duplicated or replicated by anything else. So, the poignant lyrics of that song are easily transferable to the experiences of our math education travels. It’s quite simple really. You have to meet people! But, it is just not meeting people. You need to first establish trust that is based on something outside of the domain of your product/service-regardless of how good you believe it is. We recently spent a week in California, spending time at CASTEAM 2018 in Long Beach and CMC-South in Palm Springs. One of the things that I most enjoy about working for my company is the “booth experience”. It is as organic and whimsical you can make it–because we are grateful to interact with people from a different parts of the world. It is not uncommon for people to leave our booth not even getting information/demonstration about our digital platform! That’s because we believe that the experience of meeting math educators and having robust dialogue about mathematics is our first goal. And, in order to get those rich conversations and ideas to flow, there has to be trust–that is the only portal to meaningful change and solutions in math education. The endgame is about relationships now. Even in math education, mathematics merely becomes a conduit to closer connections and friendships. Hence, at the booth, we want mathematics to serve the conversation–and not the other way around. While people are often interested in what we are selling, we quickly turn it around so that we are finding more about them first. Time is precious at the booth. It is quite easy for us to give them free access to our platform to explore at a later time, so doing a demo is not our first priority. Getting to really know people is. Diane Duacsek is a math teacher who we met in Long Beach. She must have spent over 30 minutes at our booth. We never talked about our platform. Once she mentioned that her father knew the actor Bela Lugosi, everyone at the booth was transfixed by her stories. 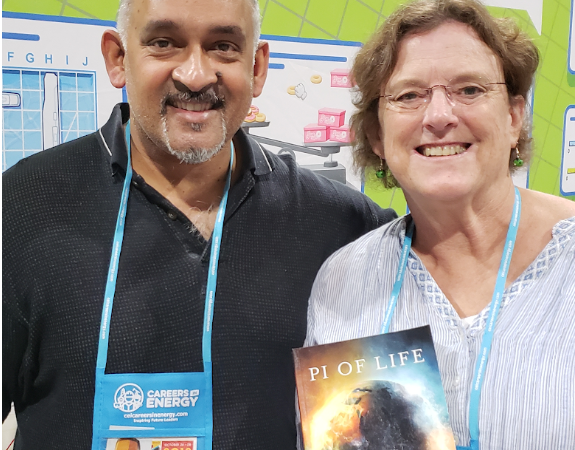 We were captivated by her stories so much, that we gave her a complimentary copy of my book, Pi of Life: The Hidden Happiness of Mathematics. If you don’t have an authentic interest in these critical human areas, then your journey in Ed Tech will ring hollow. And, even if you have the best digital math platform in the world, bypassing the desire to humanize information sharing and deeply connect with people, devalues the currency of your efforts. There is a lot of laughing and smiling at our booths. It is easy to capture those moments, as they are in surplus. And they occur because we are having an amazing time talking to people and hoping to convert them–into friends. Our compass for success is pointed in getting to know people, slowly and sincerely. Even if they do not explore our platform, we want to ensure that we gave them something valuable and meaningful–time. Time to talk. Time to reflect.